The year is 3010, the human race divided; the new breed living inside the World Administration dome network and outside the older breed. A pandemic, broken out throughout the dome network by a corrosion in the citizens' wrist chips, is causing the planet to die. Whether the outbreak was accidental or intentional, either way the reptilian race stood to gain from such an apocalypse. With most metal resources now the property of the World Administration, survival of man, beast and plant will depend on such life forms working together; and the leniency of our galaxy controllers. Wanting to write fantasy-fiction books was a childhood dream for D.M. Kirtaime but it was only after he served his country in the military did he decide to make the dream a reality. 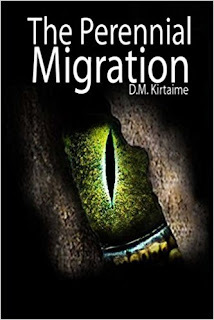 'The Perennial Migration' is his debut novel that on the outside reads as a sci-fi but looking deeper at the structure of the book and its world you can see some similarities to how the world has become today. All the characters are written with such detail that you can see the characters in your mind. 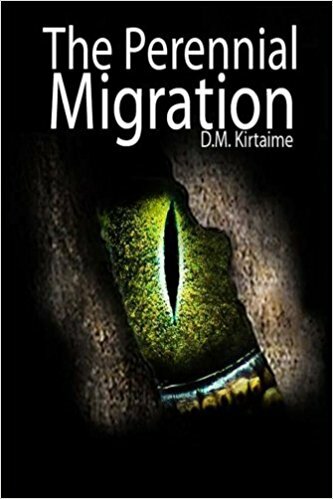 Sure what Kirtaime wrote his characters to be and what we as the reader imagine maybe two different things but that is the wonder of reading and bringing these words to life in our mind. It is a fascinating read with humans in conflict with not just themselves but other species that now roam our Earth. If you was to read just one sci-fi book this year I would highly recommend this debut novel which ends with a possibility that we may get more to come.